I needed a large dose of counter-intuition to learn how to play fifths. For years I dreaded them, since they were at the top of the list of intimidating double stops, which I already dreaded. I was trying to remember which violin teacher taught me to be counter-intuitive. I don’t remember anyone telling me to do the exact opposite of everything I had ever done. (Fortunately, anyone who watched Seinfeld remembers George Costanza saying it about himself.) That’s a tricky lesson to learn. While it sounds rather insulting, following George’s advice actually hits the nail on the head. Play poker during the break of every rehearsal. It clears the mind and focuses your attention. Here is what I did when I wasn’t thinking: Put a finger on one of the strings and burrow my way onto the adjacent string. The burrowing was pathetic, and like a weasel crawling below the earth, my finger was making a mess. My approach to the fingerboard was with a slanted finger, and slanted fingers aren’t very adept at making a strong placement on two strings. Without exception, the finger would slide around and slip under the string. If it was in tune, that was sheer luck. Many times, the undisciplined finger would even pull the string from below. Even then, I’d get lucky 3% of the time and be in tune. Being a weasel and burrowing under and over the strings clearly wasn’t an acceptable solution. What would Plan B comprise of? How different would it be from Plan A? Learning fifths correctly involved not just doing the exact opposite of what I was doing (whatever that would be!) but finding something different, yet very specific. To find a solution to something that had plagued me for years required lots of random experimentation. I’ve learned to free-associate during this process, to allow my mind to think freely about every mundane or non-related thing that enters my thoughts. This technique of exploration allows the mind to open itself to all possibilities, and to rid it of the same-old, wrong perception of how to play fifths. 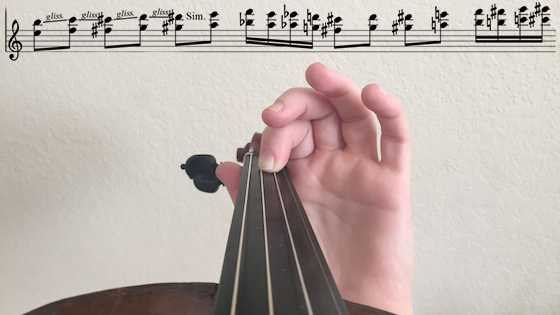 After many years of being taught to place fingers squarely on top of each string for single tones, a young violinist is suddenly required to play a fifth. Since this goes against everything he’s ever been taught, it’s natural to want to burrow over and under adjacent strings. It doesn’t help that he has to play two strings at once, a bowing skill that he may not feel comfortable with. Once I realized what needed to be done, I found myself doing counter-intuitive things. Place the finger on top of the two strings, in the same square fashion as if I were playing on only one string. I make sure that my hand has moved into a different position, either farther to the left or to the right, to accommodate and acclimate my hand to where the two strings are. Placing the finger squarely means that it is parallel to the bridge and the nut, not slanted or oblique. Fortunately, strings are very close together, and even thin fingers placed on top of the strings successfully create a parallel bridge. Just remind yourself to not place the finger between the strings, but on top. Test the quality of the finger being placed in terms of it being perfectly parallel to the fingerboard. If the notes are out of tune, its placement is off. Lift the finger, and try a slightly different angle. Once you’ve used trial and error a few times, it will become obvious which one is in tune. Remember not only how the correct way feels, but also how the incorrect ways feel. You’ll avoid those in the future. Burrowing and crawling around the fifth just creates haphazard intonation and raised and stretched strings. A far more assertive placement, straight down on top of two strings, brings to mind a quick, firm movement, like a quick reflex without time to second-guess yourself. It is a Neanderthal placement, strong and decisive. It works because the squareness of the finger across the fingerboard has already been incorporated, through trial and error, into the player’s mind. In case you’re still out of tune after carefully squaring the finger and the hand, the solution is rather simple. Determine if you’re flat or sharp, and make the necessary adjustment while maintaining a perfectly square, Neanderthal firmness of the finger position. With proper alignment, the notes will either be exactly in-tune, or if they’re out -of-tune, both notes of the fifth will be off in the exact same proportion. Those days of weasling around and under the strings, when one note would be in tune and the other part of the fifth would be off, and then vice-versa ad-nauseum, will be over.